"This is not just another law suit." IFC Films + Hulu have released the first official trailer for a documentary titled Crime + Punishment, which first premiered at the Sundance Film Festival this year. It also played a bunch of other festivals throughout this year including True/False, Hot Docs, Montclair, Seattle, Nantucket, and Traverse City. In 2010, New York City banned quotas on arrests and summonses. In 2015, a group of 12 minority NYPD officers filed a class-action lawsuit against the NYPD, alleging the illegal and continued use of quotas. 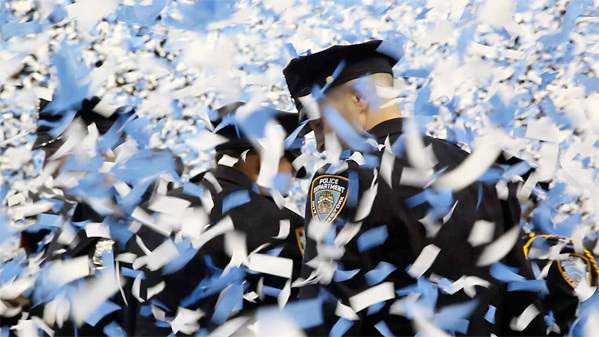 Crime + Punishment is a film about the 12 brave NYPD officers who are standing up to their department. Documentaries are becoming increasingly important in these troubled times, shining a light on the people who are doing everything to make a difference in the world. This doc won a Special Jury Award at Sundance for Social Impact - and from the looks it definitely deserved it. This is a vitally important doc film. Amidst a landmark class action lawsuit over illegal policing quotas, Crime + Punishment chronicles the real lives and struggles of a group of black and Latino whistleblower cops and the young minorities they are pressured to arrest and summons in New York City. A highly intimate and cinematic experience with unprecedented access, Crime + Punishment examines the United States' most powerful police department through the brave efforts of a group of active duty officers and one unforgettable private investigator who risk their careers and safety to bring light to harmful policing practices which have plagued the precincts and streets of New York City for decades. Crime + Punishment is directed by American filmmaker Stephen Maing, director of the documentary High Tech, Low Life previously, and a former editor as well. This first premiered at the Sundance Film Festival this year. IFC Films will release Maing's Crime + Punishment in select theaters starting on August 24th next month, then Hulu will debut this streaming. Who's interested?